More than 95% of fungi are found within just two major phyla, the Ascomycota and Basidiomycota. The Erysiphales are an order of biotrophic fungi within the Ascomycota phylum, which are better and more commonly known as powdery mildews. They survive and thrive on green plants using chemical alterations within leaves, stems, flowers and fruits to shunt sugars manufactured by the plant towards its own branch-like hyphal protrusions. These appear as a powdery white, grey or black coatings on the surface of infected plants which cause a decrease in photosynthesis and a loss of nutrients to the fungi resulting in greatly reduced plant vigour. Once an extensive network of hyphae is established on a plant millions of spores are disseminated with the help of the wind and may fall on a new suitable host. This is an order made up of more than 900 different species infecting almost 10,000 different species of trees, herbs and grasses. Individual species are identified using keys produced by experts which account for morphology of both asexual (anamorphic) and sexual (teleomorhpic) states of the fungus as well as its host species. However DNA base sequences are used in the lab and projects to identify individual powdery mildew species using molecular markers are on-going. Such molecular work has only provided taxonomic and phylogenetic debates with further fuel resulting in the names of tribes and genera being altered and positions of such genera and species being moved within the Catalogue of Life on numerous occasions. 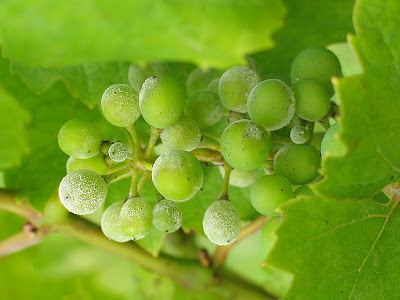 One of the best known and most researched species of powdery mildew is Blumeria graminis (DC.) Speer 1975. This is a species so specialised to grass hosts that subspecies have formed to infect solely wheat, barley and other cereal crops. As such losses in yield of these crops have risen as high as 40% in North America. While fungicides have proved useful, resistant cultivars are also being developed to combat powdery mildew on a commercial scale. However pruning back extra growth of susceptible species, such as fruit trees and roses, to allow for significant aeration of individual leaves may help to prevent similar fungal outbreaks in your own garden.